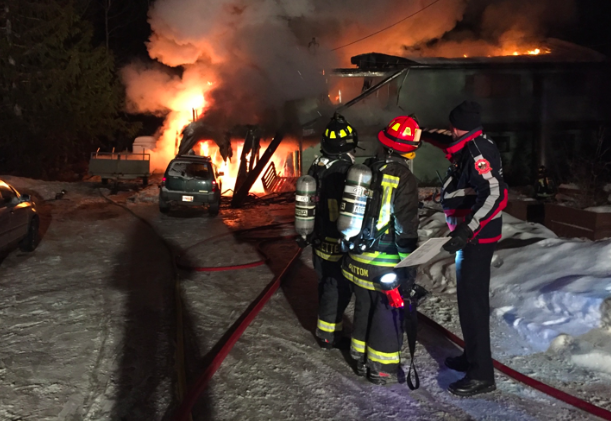 Local fire departments worked together to knock down a structure fire at the 2500 block of Granite Road Nelson Fire Rescue said in a media release Friday. The fire, causing an estimated $350,000 in damage, was kept from breaching the main floor of the residence. The 9-1-1 call came in a 11:48 p.m. Thursday. Crews arrived from Nelson Fire Rescue and Beasley and Blewett departments to see the fire was burning in the carport, the second floor of the building and through the roof. Fire crews quickly established a Water Tanker Shuttle which provided 25,000 gallons of water to extinguish the fire. “Water Tanker Shuttle Service utilizes multiple water tanker trucks to shuttle water that is dumped into portable pools for firefighting water supply,” Nelson Fire Rescue release said. Nelson Fire Rescue said although there was heavy fire on arrival, crews were able to extinguish the fire and prevent it from breaching the main floor of the structure. “This was a multi-jurisdictional team effort, utilizing 28 firefighters, two fire engines, three tender trucks, two utility vehicles, a Nelson Hydro line truck and crew, RCMP and BC Ambulance crews,” Nelson Fire Rescue said. “All services involved in the fire would like to take this opportunity to remind everyone to ensure that they have working smoke alarms in their homes,” Nelson Fire Rescue said.